Demolition crews blasted part of the old Chain of Rocks Canal Bridge to the ground on Tuesday in Illinois. The structure was a pile of rubble in a matter of seconds following the controlled explosion. It was used to cross the Mississippi River. The bridge, which for a time was used by Route 66 and was built in the 1920’s, had been out of action for decades, after it closed in 1970. It was mooted to be demolished, but managed to receive a stay of execution due to the high costs of destroying it. That was until January 20, when the structure finally came crashing down. 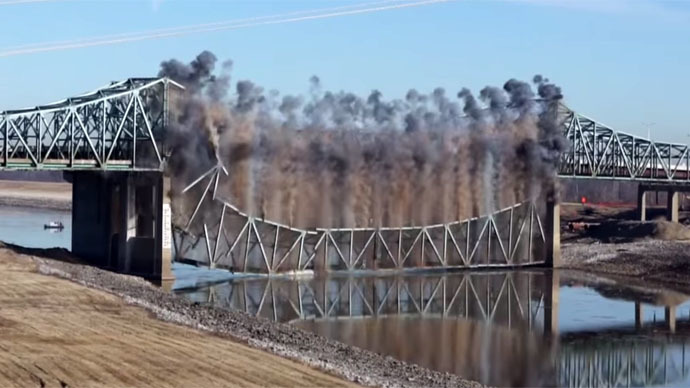 The eastbound Truss Bridge was the section chosen to be demolished first and the bridge that took years to build was gone in just a matter of seconds. In February, the westbound section of the bridge that spans the Mississippi and links Missouri and Illinois is set to be demolished too. The Chain of Rocks Bridge had been used by hikers and cyclists and was even used in the 1981 film “Escape from New York” as a substitute for the 69th Street Bridge. The bridge was replaced by the New Chain of Rocks Bridge, which carried traffic for Interstate 270. Meanwhile, the new Canal Bridge going both east and westbound opened last year. The westbound lanes opened in July and the eastbound opened in October. The project cost just over $100 million and started in 2011.